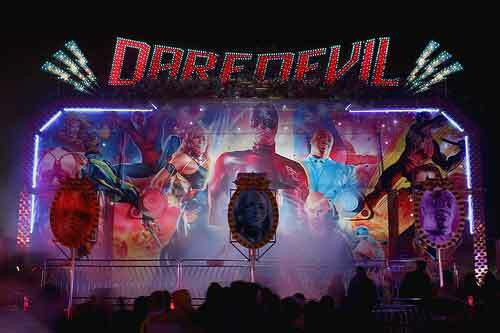 This section features Daredevil sightings by fans, be it movie posters, ads or exhibits. If you have pics that are DD-related that can be posted here, please send me an e-mail! 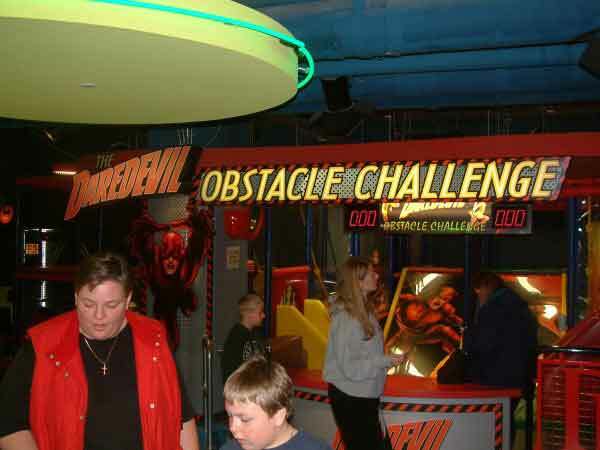 "Marvel Super Heroes," which ran in many science centres in 2006 and 2007, immersed visitors in the electrifying sights, sounds and sensations of the Marvel Universe while they explored how some of the most loved comic book heroes and villains bring science into their world. 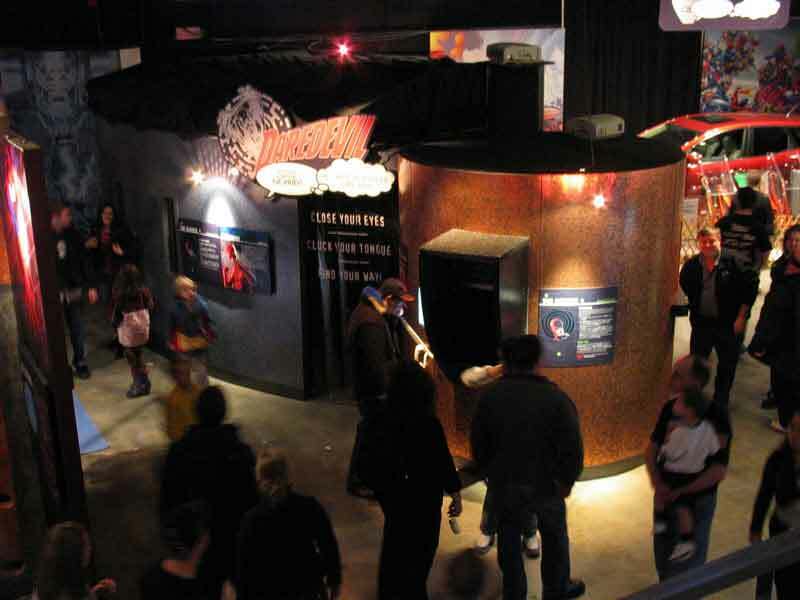 Daredevil had a special section where visitors could "See if their senses are as sharp as Daredevil's when they navigate through an alleyway using their sense of touch and hearing clues". 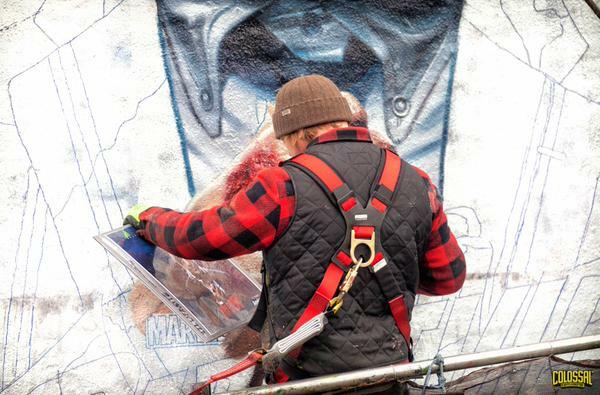 This picture is used with permission by designer Gavin McDonald and co-lighting-designer Christopher Dennis. Special thanks to them for allowing me to post their work here. McDonald described the exhibit to me: "The inside of the exhibit was completely dark and mildly padded with a few random columns spaced throughout, and as you can see, the walls are randomly curvy as well. The visitor would be encouraged to walk SLOWLY through the exhibit and make noise, seeing how the sound changed as they got close to a solid surface, helping them navigate around obstacles and through to the exit." This image is courtesy of AccessNiagara.com. 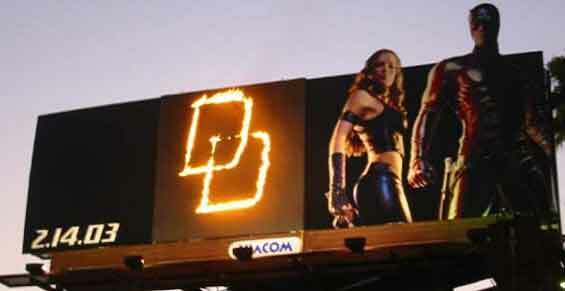 As part of the promotion for the Daredevil movie in 2003, this "flaming" billboard was on display in California. 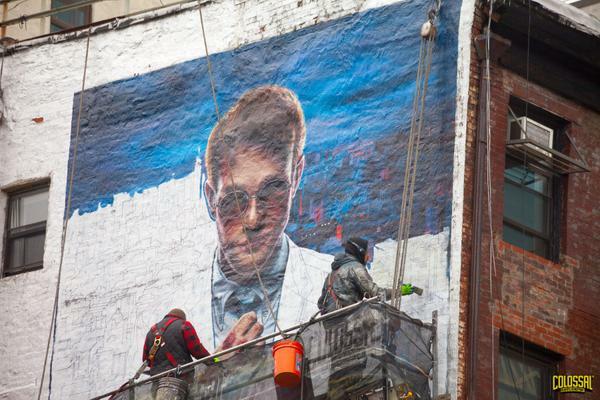 WHAT: World's First "Flaming Billboard" Fires Up Sunset Boulevard! 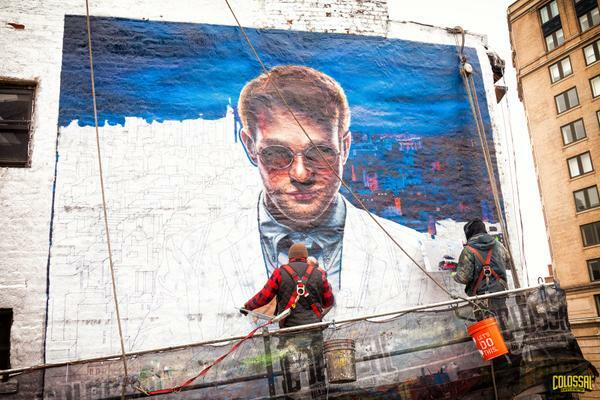 DAREDEVIL, due in theaters nationwide on February 14, has already been called the sexiest comic book movie ever. 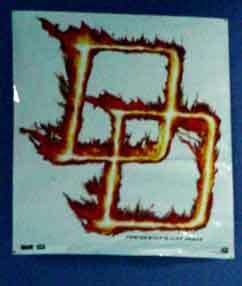 Now, the red-hot action-adventure epic starring Ben Affleck is set to make history as the title character's signature Double-D logo is set aflame on a billboard high atop some of the most famous real estate in the country: Los Angeles' Sunset Boulevard. 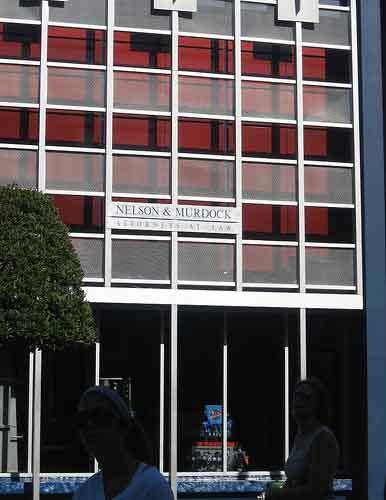 WHEN: Thursday, February 6th, 2003 at 7:00 p.m.
As part of the promotion for the Daredevil movie, movie theatres were sent Daredevil clings, to place on their windows. Here are a few pics of the clings before they were put up. 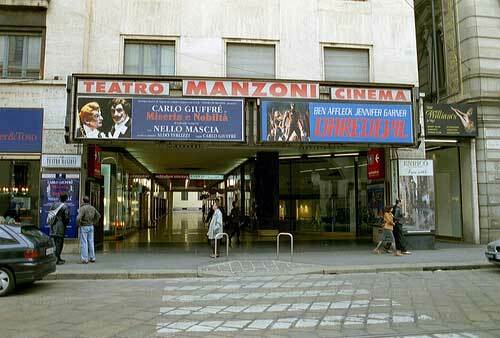 This is a pic from the Teatro Manzoni, in Milan, Italy, taken in 2006. The image is courtesy of Roloff on Flickr. 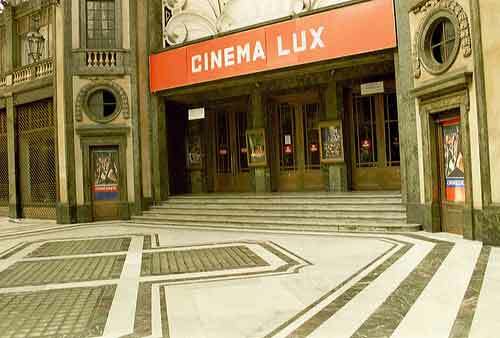 This is a pic from the Cinema Lux in Italy, taken in 2006. 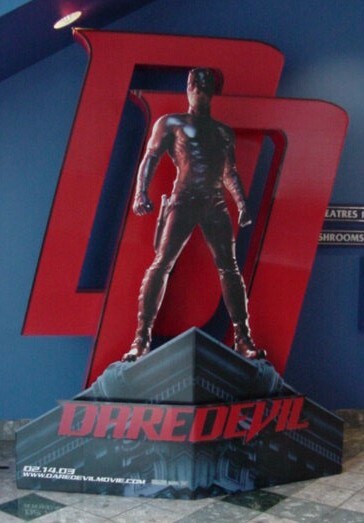 Here is a pic of the Daredevil standee that appeared in theatres in time for the movie! 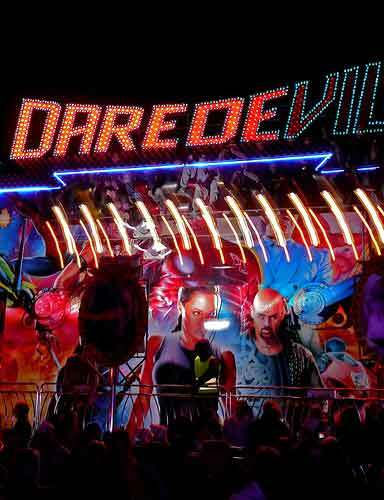 This ride was part of a traveling amusement fair which comes to Cambridge every year for Bonfire night. 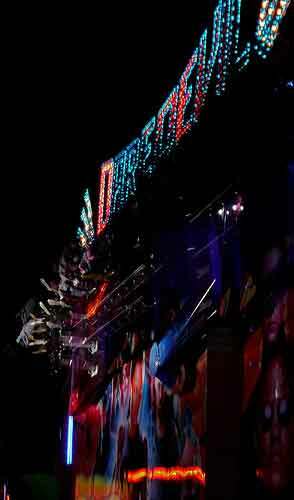 The ride packs down onto the back of a lorry. Images are courtesy of Jsysco on Flickr. 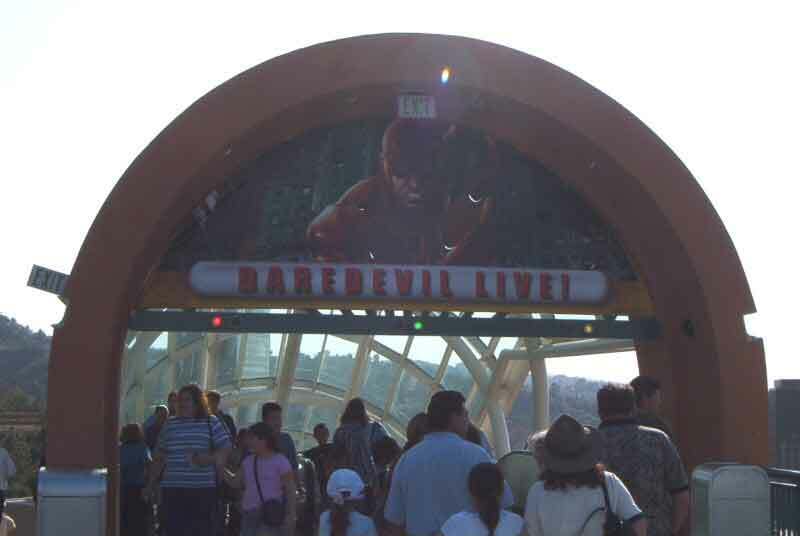 This was from Universal Studios in 2003. 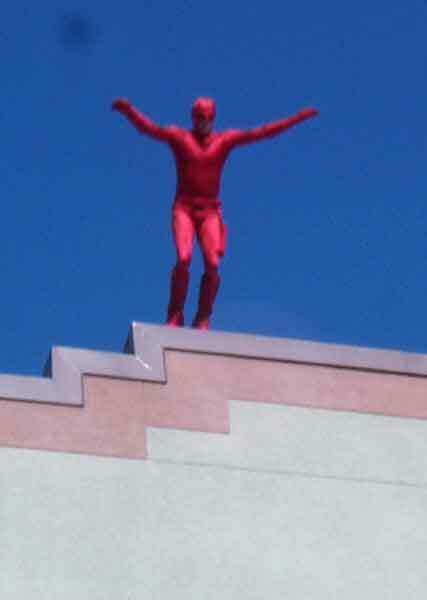 Daredevil leapt off the adjacent soundstage to join other characters on stage. 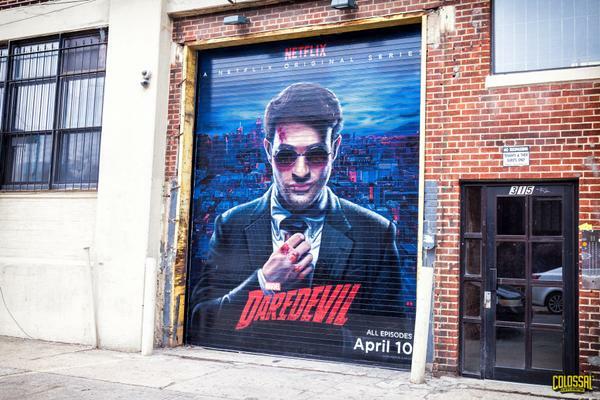 Produced by Colossal Media, these murals were hand painted in New York City to promote the Daredevil show on Netflix. Thanks to Colossal Media for the pics!